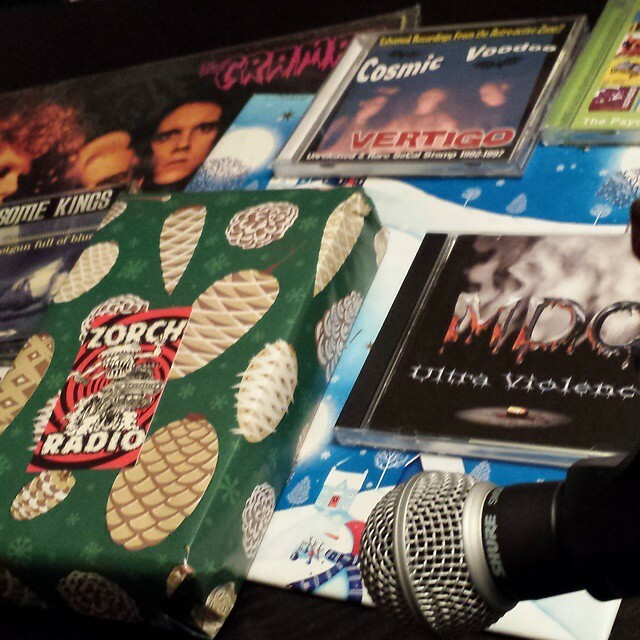 We spent tonight handing out gifts of psychobilly for tonight’s Christmas episode. Broadcasting from the Northern-most pole at the Deja Vu Gentleman’s Club, we’re all writhing with holiday cheer. Exchanging presents, and drinking alcoholic things in our itchy light-up sweaters – we wanted the focus to be all about Christmas tonight since we will all be taking that day off to spend it with our families and more alcoholic things. Tonight we asked: what are you getting for Christmas? Now, some goody-goodies out there don’t know what they’re getting for Christmas because they want Santa to surprise them on Christmas morning. Yeah, forget them. We peaked! We know! Brent told us that he’s been ordering records like crazy for his jukebox, but his wife keeps swiping them out of the mailbox so she can wrap them up and “give” them to him on Christmas morning. DJ Hodaddy is super excited for his brand new socks and underwear he’ll be unwrapping, and Jake Noose has been eyeing either a new mic or video camera that’ll be used for segments on the Zorch Radio Youtube channel. What are you getting for Christmas this year? Are you waiting to be surprised or did you peak under mom’s bed? Leave us a comment below. Don’t ignore the Events Page either, as it’s a regularly updated tool for gigs in the PNW. Feel free to also stop by the Donate page to find out how to support the program, follow Zorch Radio on Twitter, or make a submission to our mailbox listed on the contact page. Getting back to the reason for the season, what are you getting for Christmas? This entry was posted on December 18, 2014 by Zorch Radio. It was filed under Audio .